Our excavation season has just begun and we’re starting to peel back the sand that George Reisner left to cover and protect the Menkaure Valley Temple (MVT) ruins after excavating it more than 100 years ago. It’s exciting to take a look at this site with modern archaeological methods, especially since Reisner backfilled as he excavated and the western part of the site remains much as he found it and unseen since 1910. We return to the MVT this year thanks to the support of Wally Gilbert, Nobel Laureate in chemistry and a founder of Biogen. Our focus is the western third, the location of the inner sanctuary and its flanking magazines. This is where Reisner found the world-renowned Dyad and Triad statues of Menkaure flanked by his queen, the goddess Hathor, and deities of Egypt’s nomes (districts). 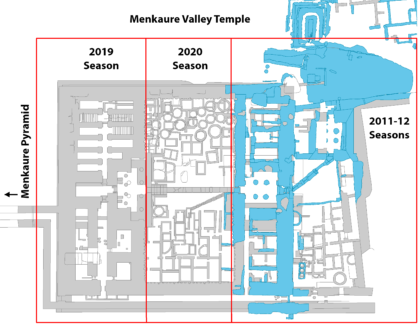 We previously excavated the eastern third of the MVT and its Annex and when we return in 2020, we will tackle the more complex settlement archaeology in the central court, where temple personnel built apartments to live in and granaries to hold their shares of temple revenues. While our excavation team works in targeted trenches at MVT, our team of material culture specialists will be making their own exciting discoveries in AERA’s field lab, nestled among the gigantic mastaba tombs west of the Great Pyramid. In the lab we will be continuing our exploration of the oldest phase of the Lost City of the Pyramids through the analysis of material from the Kromer Dump site. Last season, we collected hundreds of bags of cultural material, mostly from the lower, older phase of dumping that came from the direction of the Lost City site. While much of it still waits to be examined this year, we’ve already seen evidence of a high-status building, possibly a palace from the time of Khufu that Khafre’s workers demolished in order to create the phase of the Lost City that we have seen so far. This dumped material includes painted plaster, cattle bone, and sealings with high-ranking titles. One especially intriguing sealing mentions the Setep Za, one of the terms for the royal entourage and palace. With Dr. Zahi Hawass and the Glen Dash Foundation, in March we will also return to the Great Sphinx of Giza. In 2018 we began a survey of the Sphinx using new technologies to gather information that has come to light since the 1979-1983 ARCE Sphinx Project directed by AERA’s Mark Lehner and James Allen. This year we will focus our conventional and geophysical survey on the mysterious Sphinx Temple, which lies to the east, below the Sphinx’s giant outstretched paws. We are excited to be back in Egypt and look forward to sharing our new findings with you!